With only a half day on the ground at NAB 2018, I was very fortunate to be able to schedule this on-camera interview with Blackmagic Design President Dan May right before I had to leave for the airport. I brought my five year old BMPCC along to compare to the new camera because I wanted to hold both in my hands and compare them. Sure, I could have gone to Camerasize, but I wanted to actually see the two cameras side-by-side to determine differences in grip, weight and balance and ergonomics. First is the micro 4/3 lens mount. Although the BMPCC 4K's sensor is larger, Blackmagic put the same lens mount on the camera - which will save upgraders a lot of money. Second, neither camera has a viewfinder and both have fixed LCDs. This is common to all BM cameras - and to most higher end cinema cameras - but it is striking for a camera whose competitors all have viewfinders - and many of which have tilting or fully articulated LCDs. Third, both cameras have a 1/4"-20 socket where most consumer cameras have a hot shoe mount. Again, this makes sense for a pure cinema camera that doesn't need an external flash. But all of that is superficial - what is really important is on the inside. 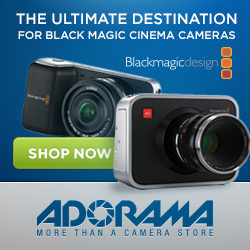 With the BMPCC 4K, Blackmagic appears to have fixed almost every one of the original camera's shortcomings. By now, everyone has read the specs list - increased resolution and higher frame rates; longer battery life; improved audio with phantom power; a larger, brighter LCD; yada, yada. What the spec sheet can't tell you is that this is an extremely well built camera. The pre-production cameras at the show were heavier than the carbon fiber production model will be, but they were still solidly put together and felt like they could stand up to the rigors of operating in the field. This is just a sense I got from handling the camera - we will have to see how tough it really is once can get out hands on the production model. If anything here has helped you to make a buying decision, please click on the links above or the display ads below or in the margins. It won't cost you anything extra, and will help to keep these posts coming. And please follow HCR here, on G+, on YouTube on Vimeo and on Twitter for the latest news on micro-budget video and cinema.